Ed Mell's bold landscapes express a lifelong connection to his home state of Arizona. "Sometimes, you have to leave a place and then come back to appreciate it,” says Ed Mell. That matter-of-fact observation profoundly distills the essence of Mell's paintings. His works capture the heroic grandeur of his native Arizona in scenes that somehow seem at once both freshly viewed and intimately understood. His images not only express the depth of his appreciation for the American Southwest but also his high level of mastery - skills he honed largely, at least in the early years of his training and career, through leaving the state he so loves. Ed Mell, Yellow Mesa, oil, 10"x20"
Born in Phoenix in 1942, Mell remembers that he “was like any kid who drew a lot.” His budding talent found an outlet largely through his obsession with automobiles. “My dream was to be a car designer, and in my teens I did gouache paintings of my friends’ cars for seven bucks a piece,” he says. Art was both pleasure and refuge for Mell, who didn't do as well in other school subjects and discovered later in life that he was dyslexic. “I probably found more joy in art because I struggled in other areas,” he says of his favorite childhood pastime. Ed Mell, Clearing Fields, oil, 18"x24"
That East Coast business success might well have continued for years to come were it not for an unexpected invitation that came Mell’s way in 1970. His friend Jon Cordalis, a ceramicist, called to ask if he might be interested in teaching screen-printing at a summer arts program for children on the Hopi reservation in northern Arizona. Mell spent two and a half months there, starting out with just a couple of students, and “then all of a sudden everybody wanted to do it.” He returned to New York but taught in the summer program again two years later. The repeat appearance led to a momen­tous decision. “Being there on the reser­vation, seeing the beauty of Monument Valley and some of the northern mesas, it just felt so fresh, so removed from that other world of New York, that I wanted to be back in Arizona,” says the artist. Five years after moving to New York, Mell found himself back home in Phoenix. He opened his own illustration studio, and his clean-lined style quickly won him assignments, in­cluding many covers for airline in-flight magazines. “The strong graphic quality appealed to a lot of art directors,” he says, “and I was making a living almost right out of the chute.” But Mell soon realized that his true desire was to focus on fine-art painting. “There’s an old saying,” he laughs, “that all art directors want to be illustrators, and all illustrators want to be fine artists. I just went through it all.” Arizona’s dramatic landscapes became his primary subject matter. “There is so much color and imagery to the scenery here,” he explains. 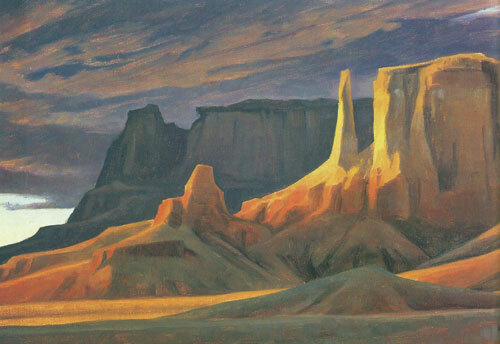 Ed Mell, Remote Mesa, oil, 30"x40"
Mell's skill and style amplify the excite­ment level even more. 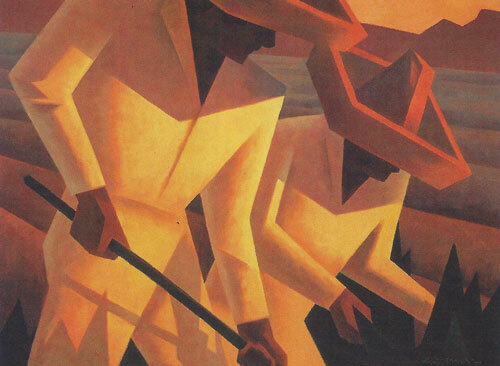 Describing himself as a “western modernist,” he finds inspiration in a wide range of sources, includ­ing the dramatically streamlined paintings of Maynard Dixon; the boldly abstracted southwestern images of Georgia O’Keeffe; the simple and forthright works of Arizona cowboy artist Lon Megargee; and the finely detailed, almost three-dimensional water-color scenes of Yosemite and the Grand Canyon by Swedish-born Gunnar Widforss. “I love all that stuff from the ’20s, ’30s, and ’40s, and those are the works that hang on the walls of my home,” says the artist. Ed Mell, Desert Diamond, oil, 40"x30"
He acknowledges that his free-spirited approach to starting a painting can lead him in two very different directions. 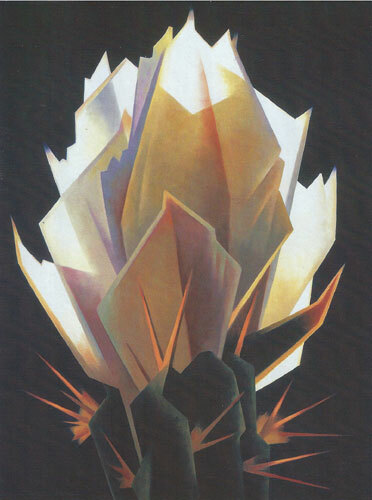 Some of his compositions are “very abstract,” such as his jagged, crystalline depiction of a cactus flower in Desert Diamond or his reduction of Arizona landscapes to bold, almost block-like forms of solid color. Oth­ers, by contrast, come off as “more realis­tic.” For example, his large-scale piece Ascending Storm/Grand Canyon heightens the canyon’s natu­ral beauty through its variegated colors and crisply delineated forms. “That painting is a good example of how I deal with the power of nature,” he says. “I'm lucky that people accept the fact that I paint in two styles,” Mell continues. “That I can move back and forth between abstraction and realism keeps me fresh.” So, too, he adds, does his occasional sculpting in clay. “Clay is a very forgiv­ ing medium I can work on at my leisure,” he explains of its appeal. His geometric, western-themed figures - cowboys, Indi­ans, horses, bulls - are then cast in bronze. When not working in his studio, he’s frequently out and about plein-air paint­ing with artist friends Gary Ernest Smith or Larry Clarkson. “You’re out there do­ing five paintings a day, chasing shadows as they move across rocks, trying to get them in place before they move on you,” he says of such on-site challenges. Mell is busy these days preparing for four shows - two museum shows and two gallery shows, all in Arizona. His works are in great demand and can be found in the permanent collections of the Tucson Museum of Art, the Phoenix Art Museum, and the Scottsdale Museum of Contem­porary Art; in the corporate collections of companies such as Atlantic-Richfield, Bank One, and TriStar Pictures; and on the walls of private collectors including Diane Keaton, Arnold Schwarzenegger, and former Arizona governor and U.S. Secretary of the Interior Bruce Babbitt. 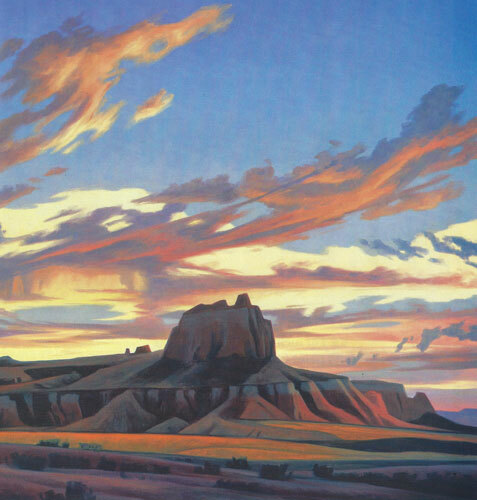 It’s particularly appropriate that Bab­bitt, long a champion of the southwest­ern environment, would prize the works of Ed Mell - a true indication that the dynamics and grandeur the artist aims to convey come through loud and clear. “The natural landscape is one of the few cherished treasures we all have,” says Mell. “Hopefully my work will help en­hance people’s appreciation for that."